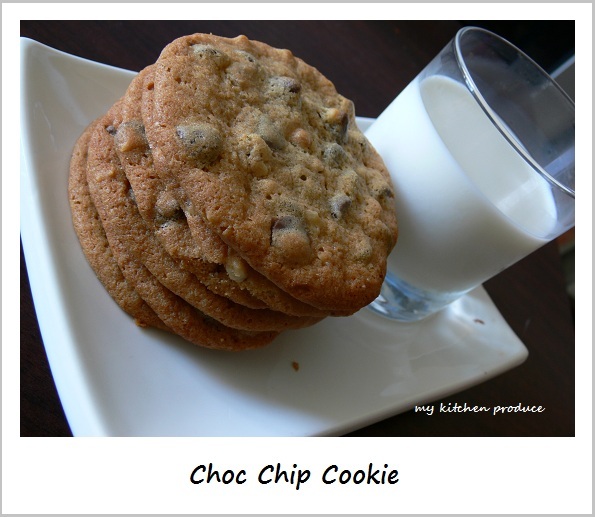 I have been searching for a genuine choc chip cookies recipe for ages, and finally I found one (Thanks Dorie). We have always been a great fan of Subway choc chip cookies because of their softness and chewiness. 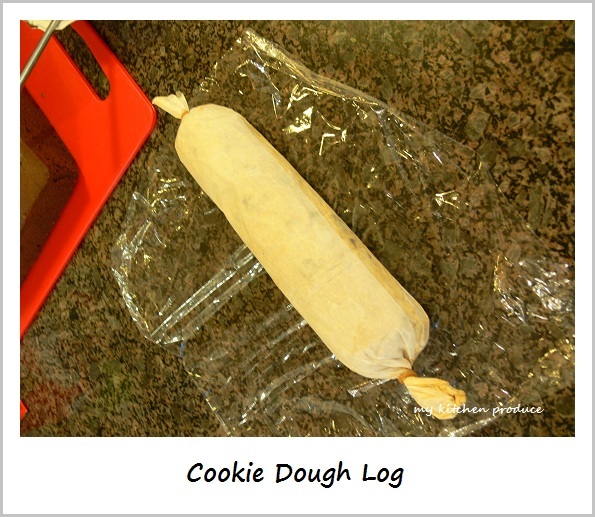 I have been wanting to make the same thing at home so I could mass produce them and store it in a cookie jar. Now I can mass produce them. However, the thing is that they won’t last longer in the cookie jar, not because they are easily spoiled but because the member of the house couldn’t resist themselves from hugging the jar. Probably you are wondering why I am cutting back so much sugar. I always cut 50 percent of the sugar from original recipe most of the time. I love desserts, cakes and sweets, but I couldn’t stand the sweetness, or probably my tooth isn’t that sweet. Even with this cookie recipe, with all the cutting sugar amount, I still found that they are really sweet. I should probably skip the sugar next time I am making these and just stick with brown sugar. Cut some baking paper, about 25-30 cm. 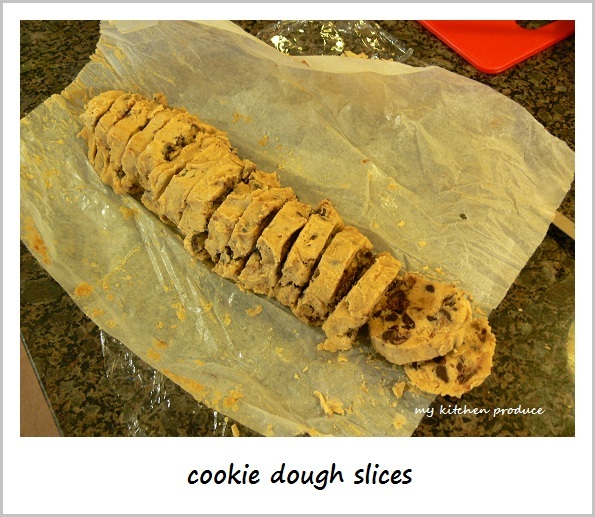 Fill it with left over cookie dough. Try to squeeze them gently so there are no empty space in the middle. Tied both ends with rubber bands. Wrap them with clings wrap. Recommended to be stored for up to 3 days in the fridge or months in the freezer. If you are storing them in the fridge, cut them with a serrated knife into certain thickness. Don’t worry with the uneven or crack slices, you could fix them later by hand. If you are frosting them, let them sit for 5-10 minutes, and them do the same things as you do with the fridge one. Center the rack in the oven and preheat the oven to 190 C.
Working with a mixer in the large bowl, beat the butter on medium speed for about 1 minute until smooth. Add the sugars and beat for another 2 minutes or so, until well blended. Add the eggs one at a time, beating 1 minute after each egg goes in. Reduce the mixer speed to low and add dry ingredients into 3 portions, mixing only until each addition is incorporated. On low speed, or by hand with a rubber spatula, mix in the chocolate and nuts. Spoon the dough by slightly rounded tablespoonfuls onto the baking sheets, leaving 2 inches between spoonfuls. Bake the cookies one sheet at the time and rotating the sheet at the midway point for 10 to 12 minutes, or until they are brown at the edges and golden int the center; they may still be a little soft in the middle, and that’s just fine. Pull the sheets from the oven and allow the cookies to rest for 1 minute, and then carefully, using a wide metal spatula, transfer them to racks to cool to room temperature.